Liverpool and Sevilla have been charged by Uefa for "crowd disturbances" at the Europa League final. 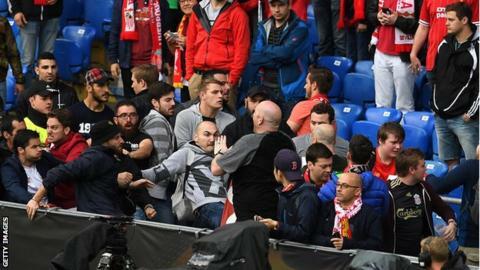 Rival supporters clashed before kick-off at St Jakob-Park in Basel, after some Liverpool fans obtained tickets in the non-segregated Sevilla end. The Spanish club, who won 3-1, sold only 7,000 of their 9,000 allocated tickets, with Reds fans appearing to fill three quarters of the stadium. Liverpool also face a charge for "setting off of fireworks". Sevilla, who play Barcelona in Sunday's Copa del Rey final, also received a charge for "throwing of objects". This case will be dealt with on 21 July.